The ‘Agarics’ are the group of fungi that produce what most people would call the classic Mushrooms and Toadstools, with a stalk and cap. Most of these have feathery soft gills on the underside of the cap. This group includes the regular common cultivated mushrooms that we eat. The range is enormous, for they can be tiny or huge, and any colour imaginable. 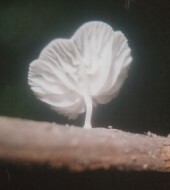 One of the bioluminescent fungi in the wet tropics, Mycena chlorophanos, belongs to this group.